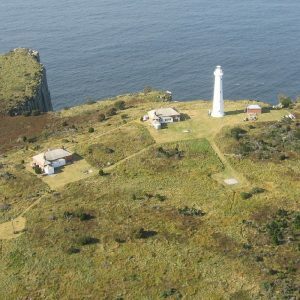 volunteer programs and groups operating on lighthouse islands and other lighthouse stations around Tasmania. In the 1990s all lighthouse stations around Tasmania became automated, and the old lighthouses and keepers houses, along with surrounding land, were transferred to care of the Parks and Wildlife Service. Since then WILDCARE Inc has worked in partnership with the Parks and Wildlife Service to provide volunteers to live in and care for lighthouse structures and the surrounding public land. WILDCARE Inc Friends groups have been established on Deal Island in Bass Stratit, Maatsuyker Island in the Southern Ocean and Tasman Island in the Tasman Sea, and volunteer caretaker programs operate on Deal Island and Maatsuyker Islands and at Cape Bruny on Bruny Island, with volunteers living on site for periods of up to 6 months. These heritage and maritime places are of the utmost importance to the story of Tasmania. Bruny Island Safaris and Wildcare Inc invite you to give generously to protect and care for Lighthouse history and heritage. Bruny Island Safaris’ founder, Craig Parsey, spent a large part of his childhood years on lighthouse stations around Tasmania, with his lighthouse keeper parents and two sisters … including Cape Bruny, Maatsuyker Island and Eddystone Point. Craig and Lelle are members of WILDCARE Inc. In addition to being co-founders and Natural Partners for the WILDCARE Lighthouse Stations Fund, Craig and Lelle make regular donations to the fund from their business.